Where are the Common Core Science Standards? We are five weeks into the 2012-2013 school year, and the english and math departments are working hard to implement common core standards for their disciplines. The school has decided to use Discovery Education as a way to test and track students. This system will be used to pinpoint deficiencies and allow teachers to tailor lessons to particular students and track student growth. This is all very exciting, but I can’t help but feel a little left behind. Do a quick search for common core science standards and you’ll find links that are over a year old and one school improvement and some information from National Research Council on a Framework for K-12 Science education. A practice is a way to coordinate knowledge and skills in order to accomplish a goal or task. The science practices enable you to establish lines of evidence and use them to develop and refine testable explanations and predictions of natural phenomena. 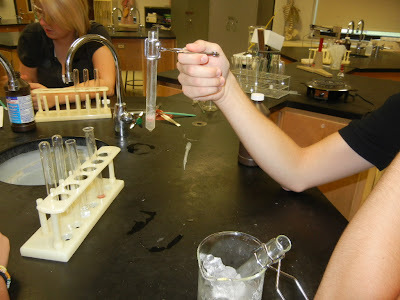 The AP Biology curriculum focuses on practices and uses four BIG IDEAS as the focal points of the biology course. Ideally, it will allow science teachers to provide in depth lessons on specific topics, and reduce the amount of information that needed to be covered in the course. This is good news for me, I always felt I was scrambling to cover all that information in a year and some of it seemed somewhat trivial. The course is now refined and much of that “trivial” content can be eliminated in favor of doing more experiments, more publishing, more discussion….in short MORE SCIENCE. This brings me back to the common core, which also seems to reduce trivial content and replace it with more thinking, reading, writing and discussion. I’m keeping my fingers crossed that the final draft of the standards will continue with this theme and we won’t have thousands of finite pieces of information that we need to cover in every class. Our current science standards in Illinois are basically a “mile wide and an inch deep” and it can be very frustrating to try to include unrelated material into a class in an attempt to get it covered before students take the test. I’ve managed to have some hilarious discussions in my anatomy class over gravity in an attempt to cover forces in a class that was never designed to have that in its curriculum. I think all science teachers have been pressured to include things that didn’t naturally fit, because we want our kids to do well on that test. If the Common Core Science Standards at least allow us to be more flexible, then that is a win for all science teachers. My hope is that the core standards will look like the AP Biology curriculum, four main ideas and a list of practices students are proficient at. Big Idea 1: Evolution- The process of evolution drives the diversity and unity of life. Big Idea 2: Cellular Processes: Energy and Communication- Biological systems utilize free energy and molecular building blocks to grow, to reproduce, and to maintain dynamic homeostasis. Big Idea 3: Genetics and Information Transfer- Living systems store, retrieve, transmit, and respond to information essential to life processes. My full AP Biology Syllabus is hosted on google docs, if you’re interested in the gory details. As much as I appreciate the change in AP Biology, this is not to say the transition wasn’t painful. The documents needed to redesign the curriculum were over 500 pages and took 2-3 weeks to digest. I took a lot of my curriculum from the samples provided by AP Central , and spent many hours putting together the syllabus, I did not go to any of the workshops presented by AP Central. This is my first year with the new design, so I expect I will make revisions as I go.